Page revised in February 2017. The location covered in this page was visited in April 2010. This page is based on a visit to St. Simeon which was made in April 2010. 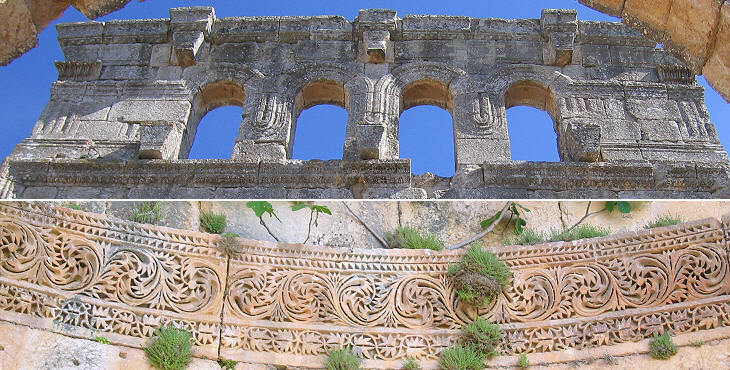 It does not reflect the impact of the Syrian civil war on the inhabitants of the site and its monuments. St. Simeon Stylites is thought to have died of natural causes at the age of seventy; because of the penance he inflicted upon himself throughout his life and in particular during the nearly forty years he spent atop a column (stylum), he was considered a martyr of faith and an imposing martyrion (martyr's shrine) was built around the remains of the column. 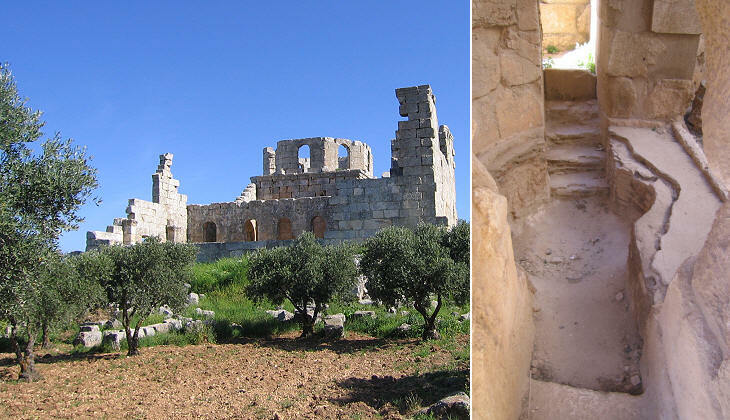 The column, similar to the cave of St. John the Evangelist in Patmos, enjoyed a commanding view; the former over the valley of the Afrin River, a tributary of the Orontes, the river which crosses Hama and Antioch, the latter over the Aegean Sea. Simeon did not live as a hermit on his column for long; the fame of his life of penance attracted worshippers to whom he gave audience and the fact that the height of the column was raised several times may not be an indication of Simeon wanting to be closer to heaven, but a way to allow a larger number of pilgrims to see him and to listen to his teachings (only men were allowed to come near the column). After an initial period of suspicion religious authorities also turned to Simeon for advice on the many theological issues which tore apart the unity of the Christians. 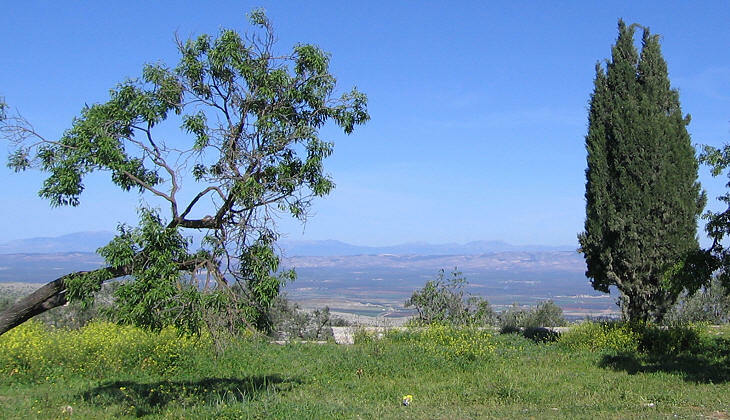 Theodoret, Bishop of Cyrrhus, then an important town in the upper Afrin valley, wrote a life of Simeon; at Simeon's death in 459 the Patriarch of Antioch ordered the transfer of the body to his city. 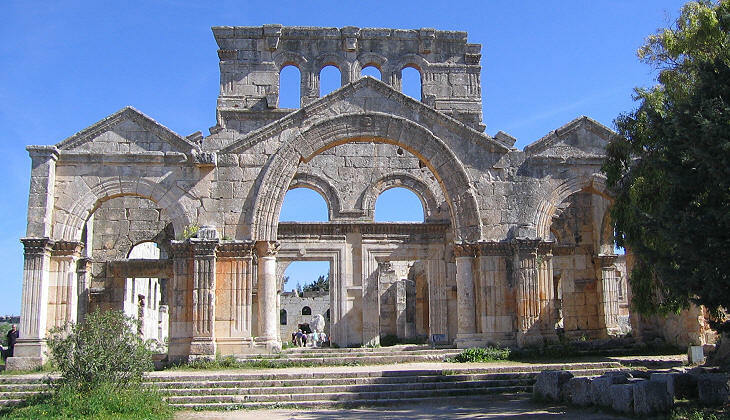 Yet, notwithstanding the absence of the body, the site where Simeon had lived for so many years continued to attract pilgrims and the column in particular became the object of veneration. In 472 the construction of a shrine to shelter the column began and it is thought that it was completed by the end of the century; there is uncertainty whether the octagonal structure surrounding the column supported a roof/dome or not; according to a chronicle of the early VIIth century the column stood in the open, but maybe the roof had collapsed soon after its construction because of earthquakes. The original column was in part "eaten" by pilgrims as it was thought to cure diseases; small pieces were detached and then pulverized before being added to food. Four basilicas projected from the octagon so that the whole shrine had the shape of a cross; pilgrims approached the complex from the south and they first saw a building which, unlike the octagonal structure, greatly departed from classical patterns; the façade of the southern basilica is regarded as a forerunner of those of Romanesque cathedrals. 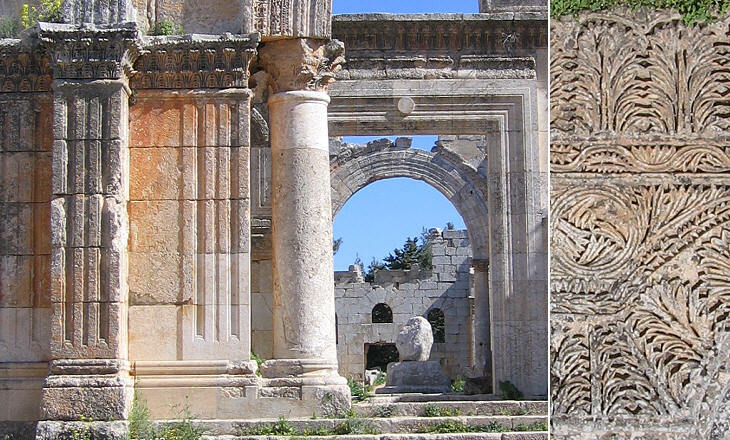 The construction of the martyrion was preceded approximately fifty years earlier by that of a large church at Qalb Lozeh where art historians have identified the introduction of very novel architectural patterns; the canon of classic art which established a proportion between width and height of the shaft of a Corinthian column (at least 1:8) was neglected and the design of the acanthus leaves was modified and it became a sort of geometric decoration. 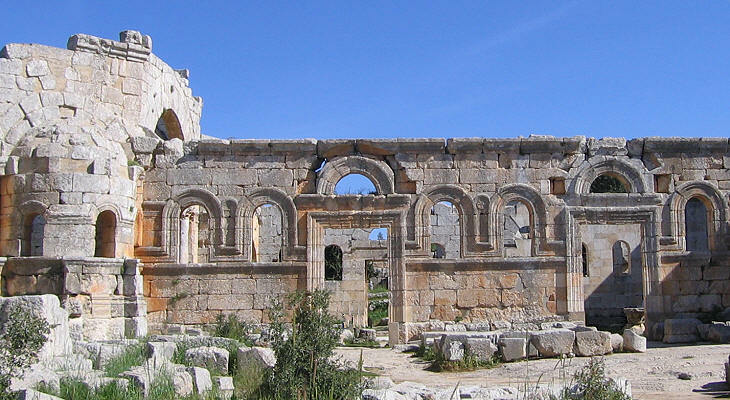 Of the four basilicas, only the eastern one was used as a church; although its main access was from the octagon, it had two large entrances on each lateral wall and an unprecedented number of windows; it is possible that catechumens watched ceremonies through these openings by remaining outside the building in a courtyard formed by two arms of the martyrion and a friary. Another explanation is that different entrances were used by men and women. The windows are linked together by a curved decorative band which appears in other buildings of the region, such as the northern church of Brad which is shown in the icon of this section. 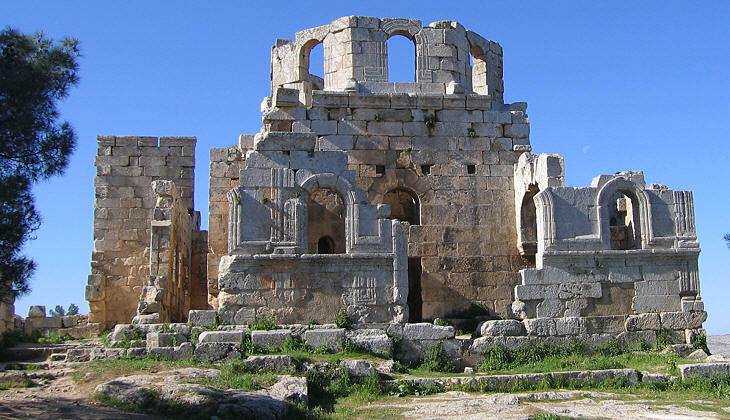 A characteristic of Byzantine churches is that they end with three apses; in the eastern basilica of the martyrion the side apses corresponded to two small chapels: the Diaconicon, which was a sort of sacristy and the Prothesis where sacred relics were kept; the access to these chapels was reserved for priests. 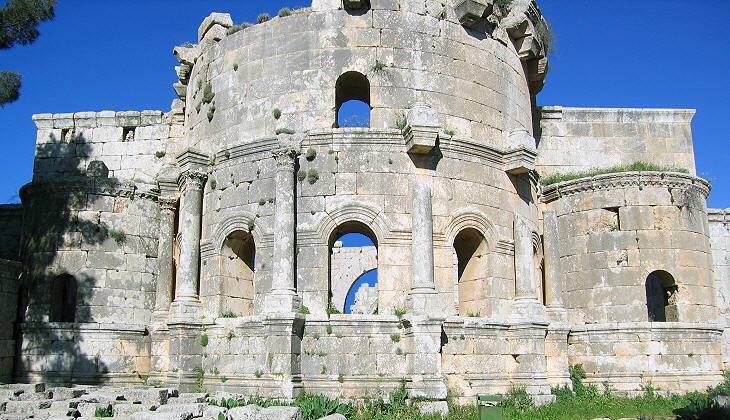 The size of the main apse was emphasized by merely decorative columns: a feature already introduced at Qalb Lozeh. The construction technique used for the martyrion was based on the careful placing of cut stones, without the use of mortar and bricks, which are key elements of Roman and Byzantine masonry; the external walls of the complex have withstood the ravages of time, but all the internal structure has disappeared; it probably relied very much on timber elements. The processions accessing the martyrion must have involved large masses of pilgrims, at least in the plans of those who designed the complex, because the northern arm seems to have been utilized to orderly manage a large flow of people, who left the martyrion through its three doors to make room for other pilgrims; another hypothesis assumes that pilgrims were lodged in this arm. 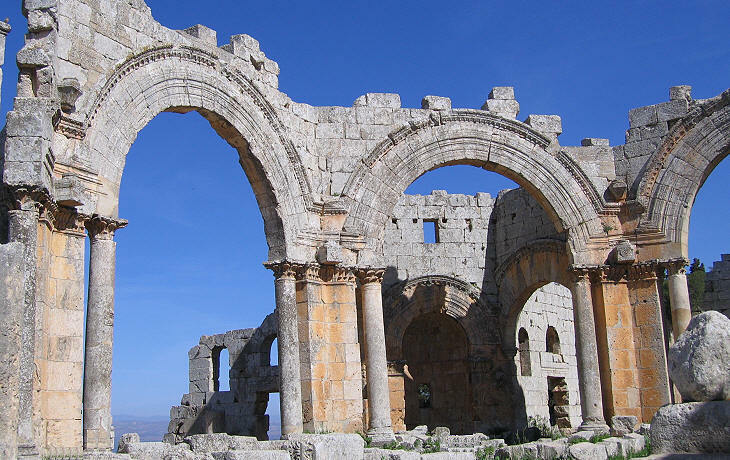 The western basilica was shorter than the others and it ended with an open loggia overlooking the valley; it was built on a terrace at the edge of the hill and landslides have caused the collapse of most of its structures. The first half of the VIth century was a golden age for the martyrion; then bubonic plagues, earthquakes and war caused a general decline in the economy and in the population of the region. 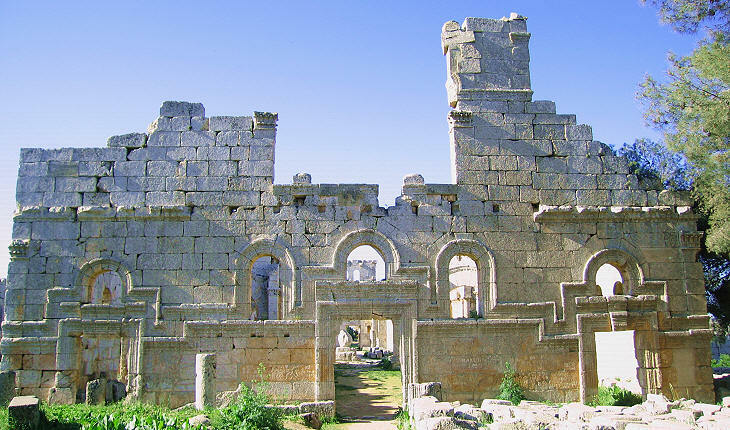 The Arab conquest did not put an end to pilgrimages to the shrine, but during the Xth century conflicts between Byzantines and Arabs for control of Syria, the martyrion was fortified by the former; when in 968 it was conquered by the Emir of Aleppo it was considered as a fortress, rather than a holy site and it was sacked; nevertheless it is thought that it continued to attract worshippers until the XIIth century when it was eventually abandoned. An imposing baptistery was built at the opposite (southern) end of the terrace where the martyrion is located. The heart of this building had an octagonal structure which probably supported a dome; this hall however was not where catechumens were baptized; the sacrament was performed in a lateral passage and most likely during collective ceremonies; (adult) candidates descended some steps into a narrow pool and came out from the other side; the process was very much evocative of Resurrection and of the beginning of a new life.